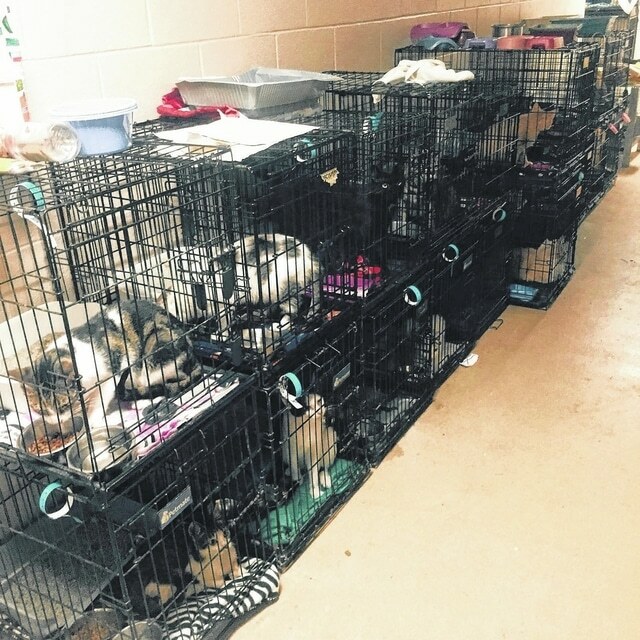 The Ohio SPCA & Humane Society rescued 70 dogs and cats from TLU Rescue and its owner’s home in Bluffton on Friday night. These cats were removed from the rescue and provided with clean bedding, food and water. BLUFFTON — The 70 animals at TLU Rescue needed to be saved twice, once by the Bluffton-based animal rescue shelter and once by humane officers Friday night. The Bluffton Police Department originally responded to a complaint Friday night about TLU Rescue, 142 Vance St., Chief Rick Skilliter said. Officers found “conditions from the exterior to be concerning,” Skilliter said, so they visited owner Wendy Dunlap’s residence on Greding Street. They found bad conditions for animals there, too, before deciding to call in the Ohio SPCA & Humane Society in Lima. Dunlap, the director of TLU Rescue, declined to comment Monday morning. “I’m not talking about anything until I speak to my lawyer,” she said. Landon was careful in discussing the case, saying she’d hand it to the Allen County Prosecutor’s Office to pursue as a criminal case. One dog died since Friday, but the other cats and dogs should be eligible for adoption at Ohio SPCA & Humane Society once they pass veterinary tests. The shelter, at 3606 Elida Road, Lima, is open 3 to 7 p.m. Wednesdays, Thursdays and Fridays and noon to 4:30 p.m. Saturdays. The rescue put a strain on the Ohio SPCA, Landon said, the facility now had 370 animals in it. The group took over the struggling former Humane Society of Allen County in November, and now it’s struggling itself. People can donate online at www.ohiospca.org, via PayPal to ohiospca@frontier.com or via mailed checks to Ohio SPCA & Humane Society; 3606 Elida Road; Lima, OH 45807. “We need people to come in and adopt, and we need the community to come back with their donations,” Landon said.